Not to be confused with his contemporary, Upton Sinclair, novelist and political activist. Harry Sinclair Lewis (February 7, 1885 – January 10, 1951) was an American novelist, short-story writer, and playwright. In 1930, he became the first writer from the United States to receive the Nobel Prize in Literature, which was awarded "for his vigorous and graphic art of description and his ability to create, with wit and humor, new types of characters." His works are known for their insightful and critical views of American capitalism and materialism between the wars. He is also respected for his strong characterizations of modern working women. H. L. Mencken wrote of him, "[If] there was ever a novelist among us with an authentic call to the trade ... it is this red-haired tornado from the Minnesota wilds." He has been honored by the U.S. Postal Service with a postage stamp in the Great Americans series. 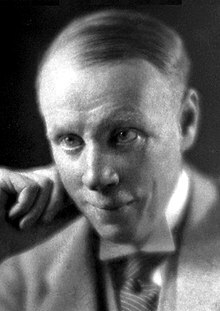 Born February 7, 1885, in the village of Sauk Centre, Minnesota, Sinclair Lewis began reading books at a young age and kept a diary. He had two siblings, Fred (born 1875) and Claude (born 1878). His father, Edwin J. Lewis, was a physician and a stern disciplinarian who had difficulty relating to his sensitive, unathletic third son. Lewis's mother, Emma Kermott Lewis, died in 1891. The following year, Edwin Lewis married Isabel Warner, whose company young Lewis apparently enjoyed. Throughout his lonely boyhood, the ungainly Lewis—tall, extremely thin, stricken with acne and somewhat pop-eyed—had trouble gaining friends and pined after various local girls. At the age of 13 he unsuccessfully ran away from home, wanting to become a drummer boy in the Spanish–American War. In late 1902 Lewis left home for a year at Oberlin Academy (the then-preparatory department of Oberlin College) to qualify for acceptance by Yale University. While at Oberlin, he developed a religious enthusiasm that waxed and waned for much of his remaining teenage years. He entered Yale in 1903 but did not receive his bachelor's degree until 1908, having taken time off to work at Helicon Home Colony, Upton Sinclair's cooperative-living colony in Englewood, New Jersey, and to travel to Panama. Lewis's unprepossessing looks, "fresh" country manners and seemingly self-important loquacity made it difficult for him to win and keep friends at Oberlin and Yale. He did initiate a few relatively long-lived friendships among students and professors, some of whom recognized his promise as a writer. Lewis later became an atheist. Lewis's earliest published creative work—romantic poetry and short sketches—appeared in the Yale Courant and the Yale Literary Magazine, of which he became an editor. After graduation Lewis moved from job to job and from place to place in an effort to make ends meet, write fiction for publication and to chase away boredom. While working for newspapers and publishing houses (and for a time at the Carmel-by-the-Sea, California writers' colony), he developed a facility for turning out shallow, popular stories that were purchased by a variety of magazines. He also earned money by selling plots to Jack London, including one for the latter's unfinished novel The Assassination Bureau, Ltd.
Lewis's first published book was Hike and the Aeroplane, a Tom Swift-style potboiler that appeared in 1912 under the pseudonym Tom Graham. 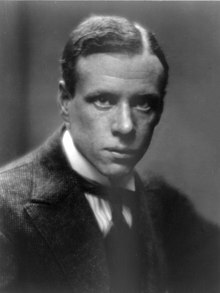 Sinclair Lewis's first serious novel, Our Mr. Wrenn: The Romantic Adventures of a Gentle Man, appeared in 1914, followed by The Trail of the Hawk: A Comedy of the Seriousness of Life (1915) and The Job (1917). That same year also saw the publication of another potboiler, The Innocents: A Story for Lovers, an expanded version of a serial story that had originally appeared in Woman's Home Companion. Free Air, another refurbished serial story, was published in 1919. In 1914 Lewis married Grace Livingston Hegger (1887–1981), an editor at Vogue magazine. 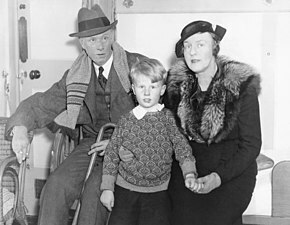 They had one son, Wells Lewis (1917–1944), named after British author H. G. Wells. Serving as a U.S. Army lieutenant during World War II, Wells Lewis was killed in action on October 29 amid Allied efforts to rescue the "Lost Battalion" in France. Dean Acheson, the future Secretary of State, was a neighbor and family friend in Washington, and observed that Sinclair's literary "success was not good for that marriage, or for either of the parties to it, or for Lewis's work" and the family moved out of town. Lewis divorced Grace in 1925. On May 14, 1928, he married Dorothy Thompson, a political newspaper columnist. Later in 1928, he and Dorothy purchased a second home in rural Vermont. They had a son, Michael Lewis, in 1930. Their marriage had virtually ended by 1937, and they divorced in 1942. Michael Lewis became an actor, who suffered with alcoholism, and died in 1975 of Hodgkin's lymphoma. Michael had two sons, John Paul and Gregory Claude, with wife Bernadette Nanse, and a daughter, Lesley, with wife Valerie Cardew. Upon moving to Washington, D.C., Lewis devoted himself to writing. As early as 1916, he began taking notes for a realistic novel about small-town life. Work on that novel continued through mid-1920, when he completed Main Street, which was published on October 23, 1920. His biographer Mark Schorer wrote that the phenomenal success of Main Street "was the most sensational event in twentieth-century American publishing history". Lewis's agent had the most optimistic projection of sales at 25,000 copies. In its first six months, Main Street sold 180,000 copies, and within a few years, sales were estimated at two million. According to biographer Richard Lingeman, "Main Street made [Lewis] rich—earning him perhaps three million current  dollars". Lewis followed up this first great success with Babbitt (1922), a novel that satirized the American commercial culture and boosterism. The story was set in the fictional Midwestern town of Zenith, Winnemac, a setting to which Lewis returned in future novels, including Gideon Planish and Dodsworth. Lewis continued his success in the 1920s with Arrowsmith (1925), a novel about the challenges faced by an idealistic doctor. It was awarded the Pulitzer Prize, which Lewis declined, still upset that Main Street had not won the prize. It was adapted as a 1931 Hollywood film directed by John Ford and starring Ronald Colman which was nominated for four Academy Awards. Next Lewis published Elmer Gantry (1927), which depicted an evangelical minister as deeply hypocritical. The novel was denounced by many religious leaders and banned in some U.S. cities. It was adapted for the screen more than a generation later as the basis of the 1960 movie starring Burt Lancaster, who earned a Best Actor Oscar for his performance. Lewis next published Dodsworth (1929), a novel about the most affluent and successful members of American society. He portrayed them as leading essentially pointless lives in spite of great wealth and advantages. The book was adapted for the Broadway stage in 1934 by Sidney Howard, who also wrote the screenplay for the 1936 film version directed by William Wyler, which was a great success at the time. The film is still highly regarded; in 1990, it was selected for preservation in the National Film Registry, and in 2005 Time magazine named it one of the "100 Best Movies" of the past 80 years. During the late 1920s and 1930s, Lewis wrote many short stories for a variety of magazines and publications. "Little Bear Bongo" (1930) is a tale about a bear cub who wants to escape the circus in search of a better life in the real world, first published in Cosmopolitan magazine. The story was acquired by Walt Disney Pictures in 1940 for a possible feature film. World War II sidetracked those plans until 1947. Disney used the story (now titled "Bongo") as part of its feature Fun and Fancy Free. In 1930 Lewis won the Nobel Prize in Literature, the first writer from the United States to receive the award, after he had been nominated by Henrik Schück, member of the Swedish Academy. In the Academy's presentation speech, special attention was paid to Babbitt. In his Nobel Lecture, Lewis praised Theodore Dreiser, Willa Cather, Ernest Hemingway, and other contemporaries, but also lamented that "in America most of us—not readers alone, but even writers—are still afraid of any literature which is not a glorification of everything American, a glorification of our faults as well as our virtues," and that America is "the most contradictory, the most depressing, the most stirring, of any land in the world today." He also offered a profound criticism of the American literary establishment: "Our American professors like their literature clear and cold and pure and very dead." After winning the Nobel Prize, Lewis wrote eleven more novels, ten of which appeared in his lifetime. The best remembered is It Can't Happen Here (1935), a novel about the election of a fascist to the American presidency. After praising Dreiser as "pioneering," that he "more than any other man, marching alone, usually unappreciated, often hated, has cleared the trail from Victorian and Howellsian timidity and gentility in American fiction to honesty and boldness and passion of life" in his Nobel Lecture in December 1930, in March 1931 Lewis publicly accused Dreiser of plagiarizing a book by Dorothy Thompson, Lewis's wife, which led to a well-publicized fight, wherein Dreiser repeatedly slapped Lewis. Thompson initially made the accusation in 1928 regarding her work "The New Russia" and Dreiser's "Dreiser Goes to Russia", though the New York Times also linked the dispute to competition between Dreiser and Lewis over the Nobel Prize. Dreiser fired back that Sinclair's 1928 novel Arrowsmith (adapted later that year as a feature film) was unoriginal and that Dreiser himself was first approached to write it, which was disputed by the wife of Arrowsmith's subject, microbiologist Dr. Paul de Kruif. The feud carried on for some months. In 1944, however, Lewis campaigned to have Dreiser recognized by the American Academy of Arts and Letters. After an alcoholic binge in 1937, Lewis checked in for treatment to the Austen Riggs Center, a psychiatric hospital in Stockbridge, Massachusetts. His doctors gave him a blunt assessment that he needed to decide "whether he was going to live without alcohol or die by it, one or the other." Lewis checked out after ten days, lacking any "fundamental understanding of his problem," as one of his physicians wrote to a colleague. In the autumn of 1940, Lewis visited his old acquaintance, William Ellery Leonard, in Madison, Wisconsin. Leonard arranged a meeting with the chancellor of the University of Wisconsin-Madison and a tour of the campus. Lewis immediately became enthralled with the university and the city and offered to remain and teach a course in creative writing in the upcoming semester. For a month he was quite enamored of his professorial role. Suddenly, on November 7, after giving only five classes to his select group of 24 students, he announced that he had taught them all that he knew. He left Madison the next day. In the 1940s, Lewis and rabbi-turned-popular author Lewis Browne frequently appeared on the lecture platform together, touring the United States and debating before audiences of as many as 3,000 people, addressing such questions as "Has the Modern Woman Made Good? ", "The Country Versus the City", "Is the Machine Age Wrecking Civilization? ", and "Can Fascism Happen Here?". The pair were described as "the Gallagher and Shean of the lecture circuit" by Lewis biographer Richard Lingeman. In the early 1940s, Lewis lived in Duluth, Minnesota. During this time, he wrote the novel Kingsblood Royal (1947), set in the fictional city of Grand Republic, Minnesota, an enlarged and updated version of Zenith. It is based on the Sweet Trials in Detroit in which an African-American doctor was denied the chance to purchase a house in a "white" section of the city. Kingsblood Royal was a powerful and very early contribution to the civil rights movement. In 1943, Lewis went to Hollywood to work on a script with Dore Schary, who had just resigned as executive head of Metro-Goldwyn-Mayer's low-budget film department to concentrate on writing and producing his own films. The resulting screenplay was Storm In the West, "a traditional American western" — except for the fact that it was also an allegory of World War II, with primary villain Hygatt (Hitler) and his henchmen Gribbles (Goebbels) and Gerrett (Goering) plotting to take over the Franson Ranch, the Poling Ranch, and so on. The screenplay was deemed too political by MGM studio executives and was shelved, and the film was never made. Storm In the West was finally published in 1963, with a foreword by Schary detailing the work's origins, the authors' creative process, and the screenplay's ultimate fate. Sinclair Lewis had been a frequent visitor to Williamstown, Massachusetts. In 1946, he rented Thorvale Farm on Oblong Road. While working on his novel Kingsblood Royal, he purchased this summer estate and upgraded the Georgian mansion along with a farmhouse and many outbuildings. By 1948, Lewis had created a gentleman's farm consisting of 720 acres of agricultural and forest land. His intended residence in Williamstown was short-lived because of his medical problems. Lewis died in Rome from advanced alcoholism on January 10, 1951, aged 65. His body was cremated and his remains were buried at Greenwood Cemetery in Sauk Centre, Minnesota. His final novel World So Wide (1951) was published posthumously. William Shirer, a friend and admirer of Lewis, disputes accounts that Lewis died of alcoholism per se. He reported that Lewis had a heart attack and that his doctors advised him to stop drinking if he wanted to live. Lewis did not stop, and perhaps could not; he died when his heart stopped. It has become rather commonplace for so-called literary critics to write off Sinclair Lewis as a novelist. Compared to ... Fitzgerald, Hemingway, Dos Passos, and Faulkner ... Lewis lacked style. Yet his impact on modern American life ... was greater than all of the other four writers together. Appeared in Cosmopolitan, July 1945. 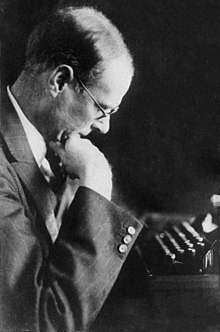 Samuel J. Rogal edited The Short Stories of Sinclair Lewis (1904–1949), a seven-volume set published in 2007 by Edwin Mellen Press. The first attempt to collect all of Lewis's short stories. ^ "Sinclair Lewis". Biography.com. Retrieved October 13, 2017. ^ Bode, Carl (1969) Mencken. Carbondale, Illinois: Southern Illinois University Press. p. 166. ^ Acheson, Dean (1962). Morning and Noon, Houghton Mifflin Company, Boston. p. 44. ^ Lewis, Sinclair (September 23, 1929), "Thoughts on Vermont", Vermont Weathervane; talk given to the Rutland, Vt. Rotary. ^ "Michael Lewis, the actor, Sinclair's son, dies at 44", New York Times, March 7, 1975. Retrieved April 29, 2018. ^ "The Romance of Sinclair Lewis". The New York Review of Books. Retrieved June 17, 2008. ^ The Sinclair Lewis Society, FAQ Accessed September 15, 2013. ^ McDowell, Edwin (May 11, 1984). "Publishing: Pulitzer Controversies". The New York Times. Retrieved February 15, 2018. ^ "Dodsworth (1936)", Time, February 12, 2005. Retrieved June 30, 2010. ^ Bongo Bear at Don Markstein's Toonopedia. Archived from the original on March 6, 2015. ^ "Miscellania", Sinclair Lewis Manuscripts, Port Washington Public Library. Retrieved June 30, 2010. ^ "Nomination Database". Nobelprize.org. Retrieved October 13, 2017. ^ a b Lewis, Sinclair (December 12, 1930). "Nobel Lecture: The American Fear of Literature". Nobelprize.org. Retrieved March 21, 2018. ^ "Lewis Is Slapped by Dreiser in Club; Principals in 'He Who Gets Slapped'". The New York Times. March 21, 1931. p. 11. Retrieved March 21, 2018. ^ a b c Arthur, Anthony (2002). Literary feuds : a century of celebrated quarrels from Mark Twain to Tom Wolfe. New York: Thomas Dunne Books. pp. 66–72. ISBN 9780312272098. OCLC 49698991. ^ "Lewis Calls Witness to Challenge Dreiser; Gets Mrs. de Kruif's Denial That Rival Author Was Asked First to Write 'Arrowsmith'". The New York Times. March 25, 1931. Retrieved March 21, 2018. ^ "Boast of Publicity Defied by Dreiser; Novelist Rebuked by Court as He Passes Lie in Connection With Slapping of Lewis". The New York Times. July 23, 1931. Retrieved March 21, 2018. ^ "Letter from Sinclair Lewis to Marcella Powers, October 7, 1940 :: St. Cloud State University – Sinclair Lewis Letters to Marcella Powers". reflections.mndigital.org. Retrieved July 13, 2016. ^ Hove, Arthur (1991). The University of Wisconsin: A Pictorial History. University of Wisconsin Press. pp. 493–495. ISBN 9780299130008. ^ Chamberlain, John (October 7, 1943) "Books of the Times". Review of See What I Mean? by Lewis Browne. The New York Times. ^ a b Lewis, Sinclair; Schary, Dore (1963). Storm In the West. New York: Stein and Day. ^ Gagnon, Order of the Carmelites, Pius M. Before Carmel Came to the Berkshires. Courtesy of the Williamstown Historical Museum, 1095 Main Street, Williamstown, MA 01267. pp. 19–22. ^ "The Short Stories of Sinclair Lewis (1904–1949)". Edwin Mellen Press. Retrieved December 31, 2013. Schorer, Mark. (1961) Sinclair Lewis: An American Life. New York: McGraw-Hill, 1961. Ryan Poll. Main Street and Empire. 2012.